This article will show you how you can install Zend Framework 2 into your windows OS without composer.phar help. You can now visit zf2.localhost.tld to get your expected site. Now the problem is URL route in IIS. That means when you lookup into ZF2 getting started docs you may find some code to edit .htaccess of apache. What about IIS in this case? IIS have solution of URL rewrite problem. Visit www.iis.net/urlrewrite to get the latest copy of the plugin to attach into your IIS installation. Just install this addon/plugin/extension/demon/program whatever name you called. 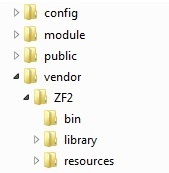 After installation you need a file web.config into your “<ZF2Skeleton folder>/public” folder. No matter, here we do a small trick. Just download Drupal 7+ core from https://drupal.org/project/drupal and unpack it. There you found a web.config file at root path. Just copy and paste that file into your <ZF2Skeleton folder>/public folder.